Home Events Ship Yes! 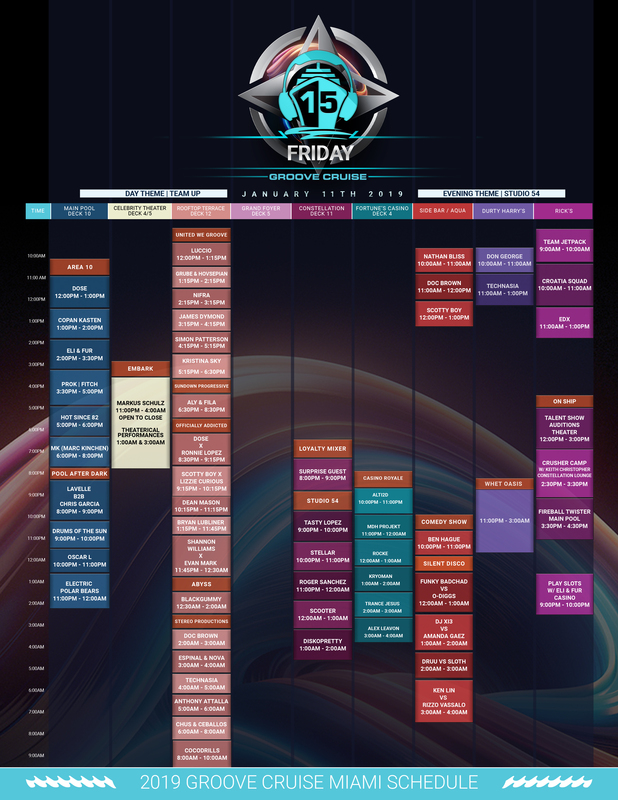 Groove Cruise Miami 2019 Set Times Are Here! Ship Yes! 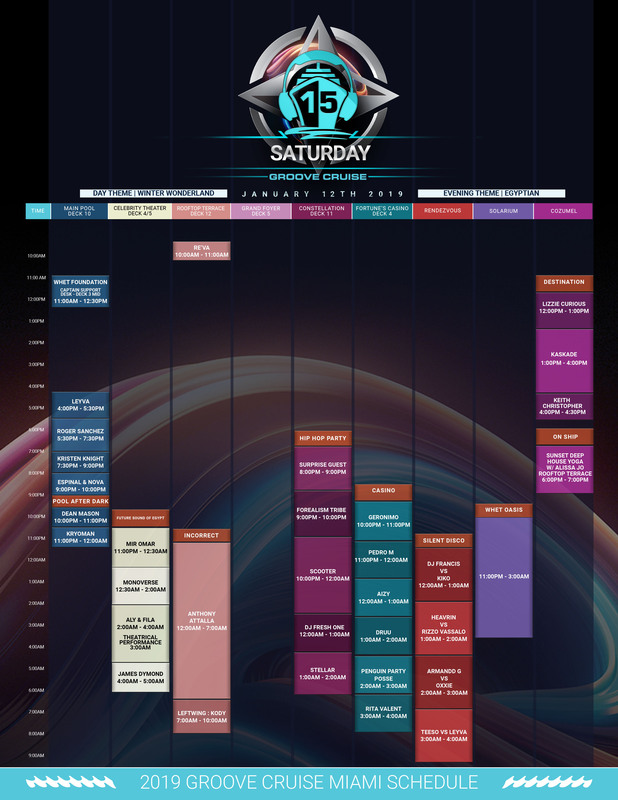 Groove Cruise Miami 2019 Set Times Are Here! In three days, Groove Cruise Miami 2019 sets sail aboard the Celebrity Infinity for Key West and Cozumel, Mexico. 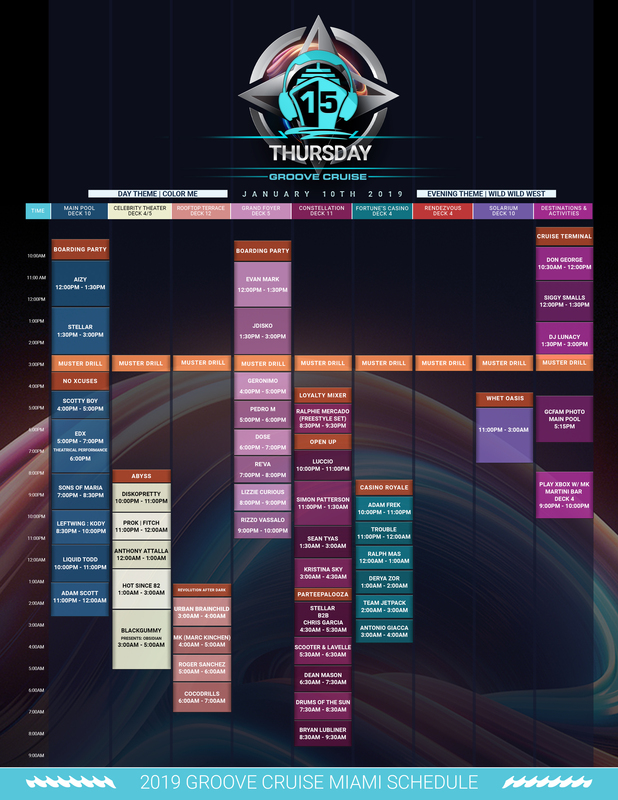 Get ready because the moment everyone has been waiting for is here–set times! The party starts before we even leave at the Ft. Lauderdale port boarding party. Listen to some tunes from the GCFAM artists while you check in, meet up with friends, and have your rooms prepared. After the muster drill (which is mandatory!) the eight stages await you. The Main Pool hosts EDX’s ‘No Xcuses‘ party as EDX himself, Liquid Todd, Adam Scott and more set the vibes for the pool. Catch the Abyss party with Anthony Attalla, Hot Since 82, Blackgummy and others for some deeper vibes at the Celebrity Theater on Deck 4/5. For all you gamers onboard, join the Xbox tournament with MK at the Martini Bar on Deck 4. Where else can you get the chance to do this but here! Who will win?? On Deck 11, the Constellation room hosts your trance talent for the night. The lineup boasts Luccio, Simon Patterson, Sean Tyas, and GC Veteran Kristina Sky. Drop by the Casino for some music in between your walks throughout the ship. This little alley will be playing all weekend long so stick around for some new music! Here’s the lineup for embarkation day. Dress with your color to represent your GC status. At night, it’s time for the wild wild west partners. Don’t forget to add yourself to the GC FAM photo at the main pool deck at 5:15pm! Team up with your friends in your best outfits for the day and prepare yourself for the weekend. 96 hours of nonstop music has already begun and day 2 gets even better. Missed anyone the first day? Don’t worry, they got you with multiple sets the entire weekend! Waking us up is Croatia Squad at Ricks from 10:00am-11:00am followed by a 1.5 hour set from EDX. Want deep house? Scotty Boy and Doc Brown play at the Side Bar from 11:00am to 1:00pm. United We Groove’s lineup with Grube & Hovsepian, K Sky, Luccio, Simon Patterson and more bring us to the evening. Aly & Fila will put on a progressive set at sundown and we cannot wait. The Area 10 stage party will once again have Hot Since 82, MK, and more at the Main Pool. This is a big day for onboard activities so be sure to attend! There is a comedy show with Ben Hague from 10pm-11pm for those that want to rest and enjoy a few laughs. Talent show auditions for the best GC’er will be held from 12pm-3pm in the theater. Fitness gurus, head to Crusher Camp with Keith Christopher in the Constellation Lounge from 2:30pm-3:30pm. Following that workout, reward yourself with Fireball Twister at the Main Pool from 3:30pm-4:30pm. The theme of the night is Studio 54 so dress with sparkle, shine, and sheen. It’s disco night and what better thing to do than play slots with Eli & Fur in the Casino from 9:00pm-10:00pm. The Studio 54 stage party is ready for you. Don’t forget the Silent Disco for the late night/early morning fun. If you ever feel like you need a break from it all, the Whet Oasis is available to chill in from 11:00pm-3:00am. We arrive in Cozumel and Kaskade takes over the beach with a 3 hour set from 1-4pm. For those needing to get their zen on, deep house yoga returns with Alissa Jo on the Rooftop Terrace from 6-7pm. Whet Travel always gives back to the community each sailing with their Whet Foundation program so anyone wanting to volunteer can meet from 11am-12:30pm. Volunteers will join some staff in donating some goods to the locals of Cozumel. Back on ship, the music continues with the Hip Hop party in the Constellation Lounge. Future Sounds of Egypt is hosting a stage party with Monoverse, Aly & Fila, James Dymond, and Mir Omar–this is a new one and we are very excited for this. Anthony Atalla returns with his marathon set of Incorrect Hours from 12am-7am. We told you this was a nonstop party! Get a look ahead at Saturday’s lineup below. During the day, it’s a winter wonderland theme but at night, walk like an Egyptian. There is still so much music to explore day 3 so get to it! We spend the day at sea returning back to where we began. Let’s give it one last go before we return home. Start your day off with some Deep House Brunch DTLA style with Lizzie Curious, Lavelle Dupree, and the rest with Scotty Boy and his gang at the Rooftop Terrace from 10am-7pm. Coldharbour is hosting their stage party at the Main Pool deck from 10am-5pm with a surprise guest two hour closing set. 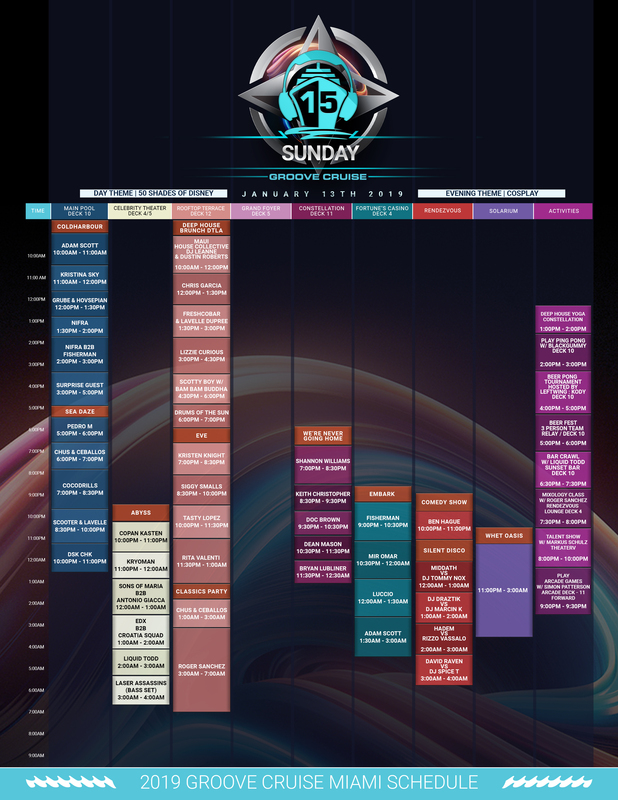 Your onboard activities for the day include Deep house yoga from 1pm-2pm. Try your hand at beating Blackgummy in ping pong on Deck 10. Following that is a Beer Pong tournament with Leftwing:Kody. If you couldn’t make that, then grab your drinking buddies and head to beer fest for a 3 person team relay from 5pm-6pm. Join Liquid Todd on a bar crawl and challenge him to get drunker than you–he’s actually quite good at that. All you fancy cats out there that want to learn how to mix your own drinks can take a mixology class with Roger Sanchez in the Rendezvous Lounge on Deck 4 from 7:30pm-8pm. Winners of the talent show auditions can showcase their amazing talents in the Theater as Markus Schulz provides the music from 8pm-10pm. End your night with Simon Patterson and some arcade games on Deck 11 – forward. 50 Shades of Disney is the theme for the day and the evening is cosplay. We expect some interesting costumes from you guys, GCFAM. Show us what you got! As always, Bryan Lubliner hosts his “We’re Never Going Home” stage party alongside Dean Mason, Shannon Williams, and others. The Sea Daze stage party has EDX b2b with Croatia Squad (whoa! ), a bass set from Lazer Assassins, Cocodrills, DSK CHK, and more. The Silent Disco is popping off with a bunch of versus sets from Rizzo Vassalo, Hadem, and more. The Classics party brings us back to port and into the sunrise with Chus & Ceballos followed by Roger Sanchez. Enjoy the last day and plan it accordingly with the flyer below. Sea you in three days!